Signing off and toasting: To building better blogger outreach skills so you may actually get backlinks and/or feedback from fellow bloggers. If you’ve been getting emails from strangers lately asking for backlinks to or feedback on their post, I have the solution for you! The emails I’m talking about are poorly customized form letters asking for a favour, yet offering nothing in return. The emails that are impersonal and not very thoughtful. The email that may be asking for a link to their blog post that may be COMPLETELY INAPPROPRIATE AND UNRELATED TO YOUR BLOG POST. If you’ve been getting these emails, here’s what you can do. 2 – Non-personalized, non-thoughtful accolade. 3 – Friendly ask, with no mention of benefits to blog readers or owner, nor even a tiny offer like a social share. 4 – Unsubscribe? Are you freaking kidding me? I have NOT subscribed (and you’d better not be adding me to your email list!). 5 – That’s a home page URL for a website, not an article (how do you “love” that “article?”). This is clearly an import without a person even doing a final edit. 6 – Import of my “official” wordpress.com site name, not the one a normal person would use (e.g. 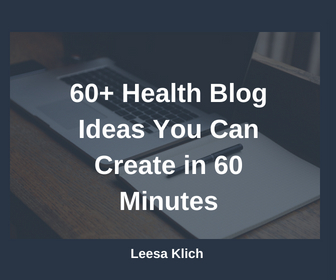 “Leesa Klich Health Writer” vs. “Leesa Klich”). 7 – Inappropriate link request. My post is on content curation NOT chia seeds! First and foremost, if you get something like this DON’T FEEL SPECIAL! The person is using software to create hundreds (thousands?) of these and sending them out to E-V-E-R-Y-O-N-E! I find it hard to believe that they actually care about you or your blog readers if they use this method. Heck, I’m willing to bet they haven’t even read a single one of your blog posts! They may not even know who you are! They’re using a program to search the internet for keywords or people who linked to the one post they’re competing with and you, my friend, are a needle in the haystack. They’re playing the lottery using the “spray and pray” method to reach out to as many bloggers as possible, hoping for a few bites of their bait. Secondly, you don’t even have to open these emails, and you certainly don’t have to click or respond. In fact, you probably shouldn’t spend any time even contemplating these requests. As a side note, I spent time creating this post and video as a public service announcement to my fellow bloggers. Neither you nor I need to spend a second further on this tactic. Third, if there is a clickable link and you’re curious, make sure it’s not trackable. You do this by hovering over it with your mouse (not sure if/how this works on smartphones). If the link displayed at the bottom of your screen is different from the one they’re showing, don’t click it! Fourth, if you want to reply (and you don’t have to), I made you a video you can send to them. 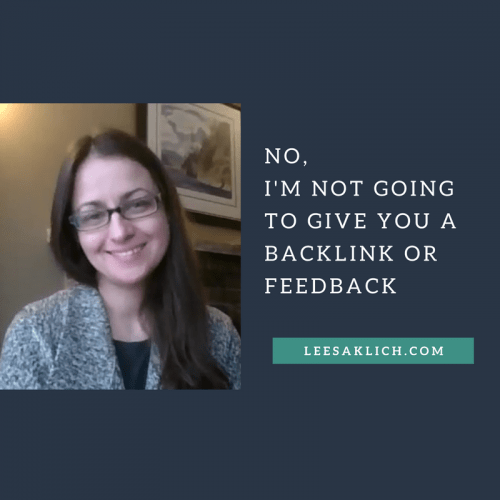 This video tells the person that you’re not going to give them a backlink or feedback. More importantly, it gives them seven tips on how they should approach bloggers in a more generous, genuine way. If you send these kinds of emails, please heed these seven tips. What do you think? Have you received many of these? Would you give a backlink or feedback? If so, why? Ugh! I know exactly what you mean. I am just starting out so no one asks me for backlinks yet:) But I keep getting unsolicited emails from web designers and SEO people who want to build me a site when they see that I have registered a couple of new domains. It is obvious that they have not even looked at my site or blog and they are just spamming everyone they can find who as recently purchased a new domain. It’s a rude, cold way to market. I love your site. You are an inspirational “butterfly” to an aspiring health writer still in the cocoon. I love your philosophy page especially. Thanks for turning me on to Brene Brown. I really needed that today! Yes! I’m not against cold-calling, but Pleeease customize it to the person you are contacting – tell them how it’s going to benefit them or their readers. Spend more than zero seconds getting to know them. I’m so glad you liked the Brene Brown video – she really inspires me!